Medical astrology is a specialized branch of Vedic astrology. It is an extraordinary predictive and counseling tool. A horoscope indicates good bad or indifferent traits and physical, emotional or spiritual characteristics of the native as per the karmic flow. A chart is only the representation of one’s Karmic implications in one’s life through planetary influences. The medical astrology helps in understanding well in advance where the human chain is the weakest in the physical body and why. An astute astrologer will be able to diagnose disease and the diseased body part merely by analysis of the horoscope. He should be able to tell the susceptibility or the resistance which a native has for a particular disease. He may be able to tell the period of onset/ recovery from the disease and can also suggest the remedial measures to reduce its severity without any side effect. Once this is known, it will be easier for medicos to quickly arrive at the cause and place of diseased body part and the treatment to which the patient will respond. The diseases are generally indicated by the malefic influences of plants. 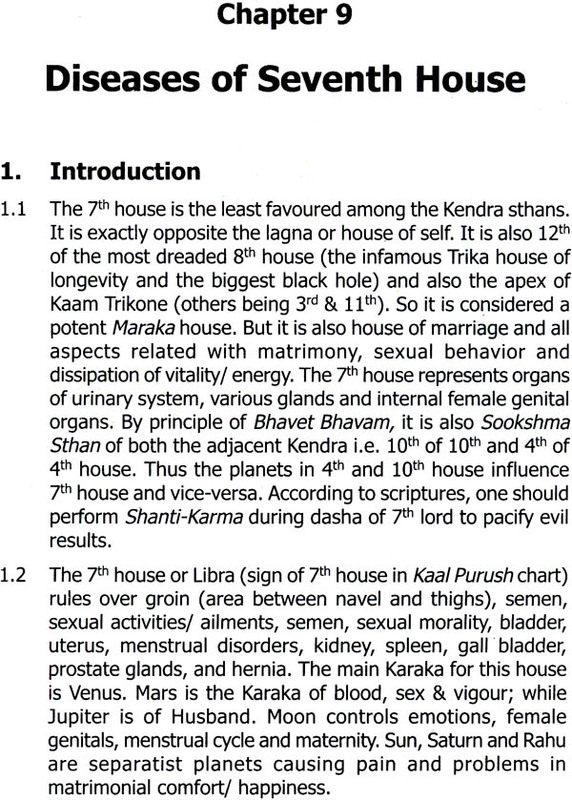 House signs and Nakshtras where in the planets are placed indicate tendencies, susceptibility, resistance and potential of various ailments in the body. When these potential will manifest depends upon the dasha periods and transit of planets. The numbers of diseases which a native may have to encounter are numerous. However this book touches upon 112 diseases with the help of 102 illustrative charts. The last (16th) Chapter of this book is devoted to common astrological remedies with a new Karmic and practical point of view to propitiate evil planets causing ailments. The author is a mining engineer from “Indian School of Mines now known as IIT Dhanbad. He has put in 28 years of service in the army as an engineers’ officer. He is a Jyotish Acharya from Bhartiya vidya Bhavan . For a long time, he has been pursuing astrological studies as keen students. His researches reflect his analytical approach to go into the details as an engineer and then he put them across frankly as an Army officer. The author has earlier written many books (List on front inner cover Pafe) which have been received well by the astrological fraternity. Over the past few decades, people’s interest in disease free good health has grown exponentially. As per world Health Organization, “Health is a state of complete physical, mental & social well being and not merely the absence of disease or infirmity”. The term disease consists of two syllables -dis & ease; meaning thereby a state of negation of normal comfort of life. The word Swasthya (health) is also made up of two syllables-swa & sthit. When a person is Sthit in Swaor Atma, he is healthy. ayurveda considers a person healthy, if is Mansic and Atmic Sthiti put together called Swasthiti is sound & cheerful. It is rightly said, “Pehla Sukha Nirogi Kaya” i.e. the first and foremost happiness in life is to be free from disease. We are all concerned about our health and vitality, which is the foundation of every/anything else that we attempt in life. Medical astrology or astrology of disease is one of the very important specialties of astrology propounded by our sages of yore for centuries combining Vedic astrology and the medicine/other remedial measures. Astrology has been used for medical purposes since the time of the chaldean priest-physicians of 2000-1000 BC, and was used by those who founded and inspired our modern medicine of today. “A physician without knowledge of astrology cannot rightly call himself a physician.” Hypocrites, Father of Medicine (460-377 BC). “The study of the natural would by which to attain the knowledge to heal, extends as high as the stars,” and “Treatment without the use of astrology is like a lamp without oil.” said Nicholas Culpeper (1616-1654), famous English herbalist, astrologer and medical practitioner.” Anything born in the moment of time carries the quality of that moment,” opined Carl Jung (1875-1971), famous Swiss psychologist and astrologer. For over 3000 years, the ancients blended the wisdom of the earth (the herbs) and the heavens (through the astrology) to promote healing and a natural state of balance, as they recognized the interconnectedness of nature. It demonstrates in a profound way, how everything; health, people, signs, planets, herbs etc. are all interconnected. Just like planets and signs, herbs contain elements found in nature; so does the human body. The body contains all of the four elements found in nature: Fire, Earth, Air and water, and incorporates their energetic qualities. Good health is represented by all four elements being in harmony; while poor health comes from imbalance indicated by the placements of certain planets in our natal chart or in a chart calculated at the time of illness. A chart analysis can indicate that a person may have an excess of or deficiency in a certain element and a person may suffer from the body and emotional sensitivities associated with signs. So a medical astrologer would know which organ or body system requires treatment. Since ancient times, herbs were the treatment of choice. Plants, like people, are part of the cosmic drama. They were selected to help with a medical condition based n the pants’ association with some of the four natural elements and with a planet or sign, which determined their healing virtues. Vedic astrology is based on laws of nature, which express the unity within the diversity of life with great precision and compassion. It is the study of the subtle energies emanating from the sky upon humans, animals, plants and the Earth itself. These energies influence the human body and mind at all levels. Human ailments can be linked to the outcome of the gravitational pulls exerted by the planets through their rotation and revolution with respect to one another. Vedic astrology and Ayurveda(Vedic medicine) are closely related designed to harmonize ourselves with the nature and the greater universe of consciousness. This correlation shows how psycho-physical and planetary forces reflect each other in our makeup including their disease causing potential. Medical astrology is as dependable as any other medical science. As a modern medical practitioner uses his stethoscope, an astrologer uses the horoscope. If the doctor uses his clinical diagnose based on pathological, physiological and radiological tests, rhe astrologer uses the holistic synthesis of houses, sign, Nakshatras, planets and dasha and transit to arrive at his diagnose. In cases of doubt, the doctors resort to microscopic studies and the astrologer study the relevant divisional charts. The doctors treat the patients only after the symptoms of disease make their appearance and advance many theories about the appearance of disease. Many a time they say that the patient has come late or at a much advance stage of disease and simply put the patient on a permanent regimen of medicine and diet. Although it is a known fact that all allopathic medicines have some degree of adverse side-effects and /or after some time lose their effectiveness on the patient. It is here that an astute astrologer, through his knowledge o medical astrology, takes a lead over modern medical practitioner. He will be able to diagnose disease and the diseased body part merely by analysis of the horoscope. He should be able to tell the susceptibility or the resistance which a native has for a particular disease. The surprising thing is that by study of dasha & transit he may be able to tell the period of onset and recovery from the disease. He can also suggest the remedial measures to reduce the severity of the disease without any side effects. But it does no deal exhaustively with nature of disease and necessary surgery. The medical astrology should be considered as a complementary/ supplementary tool but never as a rival to modern medical science. 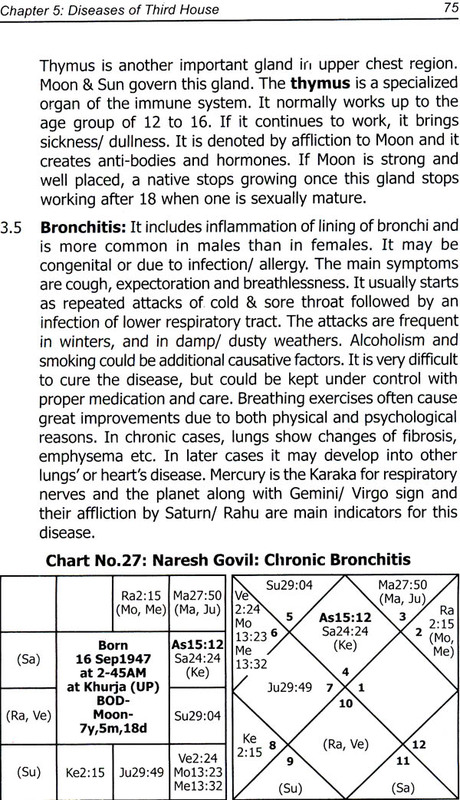 The medical astrology has a great role play n preventing/diagnosing disease. Many a time it has been experienced that even in cases of surgeries/ operations, where allopath has a definite edge, the auspicious Mahurat as suggested by the astrologer proved beneficial to both the patient and the doctor in giving relief/glory. If Ayurveda and Allopathy can be mixed to lead to medical courses, why not mix the Medicine and astrology also to help the early and accurate diagnosis of diseases. Medical astrology is an extraordinary predictive and counseling tool. There are many wonderful stories whin an astute astrologer has pinpointed specific ailment and its duration & severity with uncanny accuracy. Our soul is a “Karmic being” as opposed to merely a human personality. It carries our Karmic propensities called Samskaars from one life to another just like it’s DNA. Just as the physical body has its genet code, each soul has its Karmic code. Note how two children in the same family can share the same genetic pattern and yet have defferent lives & characters based on their respective Karmic code. Astrology is a science of Karma and of time. There is nothing in our birth chart that does not have Karmic implications on one or the other level of our life/ nature. We live in an ecological age and must recognize that Earth, on which we live, is not just a material formation but has a definite organic field possessing a self-regulating awareness and receiving comic impulses and vibration from other stares & planets. We must adapt to nature’s environment and law, if we are to survive as a healthy and lasting species. In addition to all living and innate beings, there are varied cosmic beings and powers ruling over different layers of existence from subatomic to supragalactic realms. 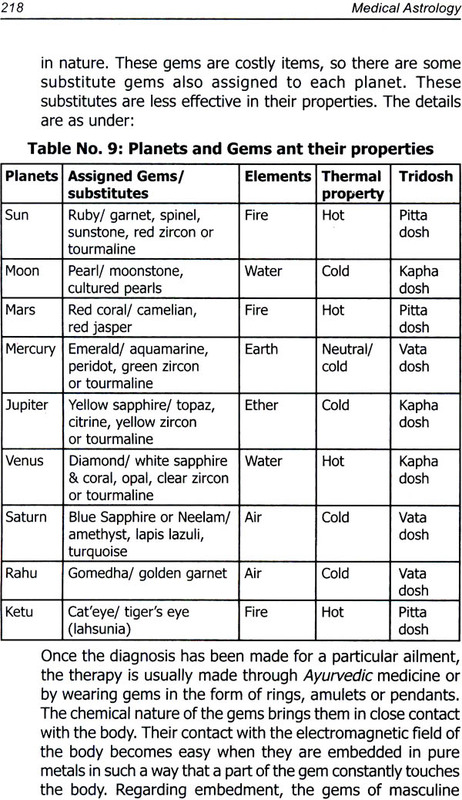 All these form the Kaal purush or cosmic person of Vedic thoughts influencing astrology and medical astrology in particular. The medical astrology helps in understanding well in advance where the hun=man chain is the weakest in the physical body and why. Once this is known, it will be easier for medicos to quickly arrive at the cause and place of diseased body part and the treatment to which the patent will respond. They will thus be better equipped to decide on the type of treatment/ medicine. The mind has a great control over physical body. A happy mind subdues many physical problems. Happiness can be enhanced by stopping unnecessary worries. Excessive worries affect/disturb hormone secreting glands resulting in many physical/ psychological ailments. In such cases, treatment of relevant gland would prove beneficial. 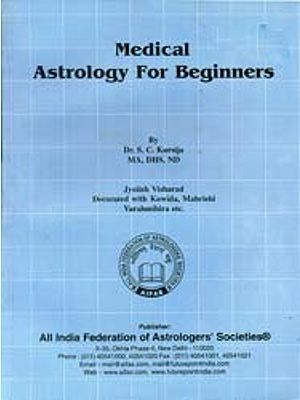 Medical astrology is as relevant today as it was during ancient times and can be used for preventive or curative purposes. Our state of health reflects our interaction with our environment, which on the level of subtle and cosmic forces indicates planetary influences, astrology works on holist philosophy, as it addresses the human organism in relation to the grater whole of the solar planetary system in which it operates. 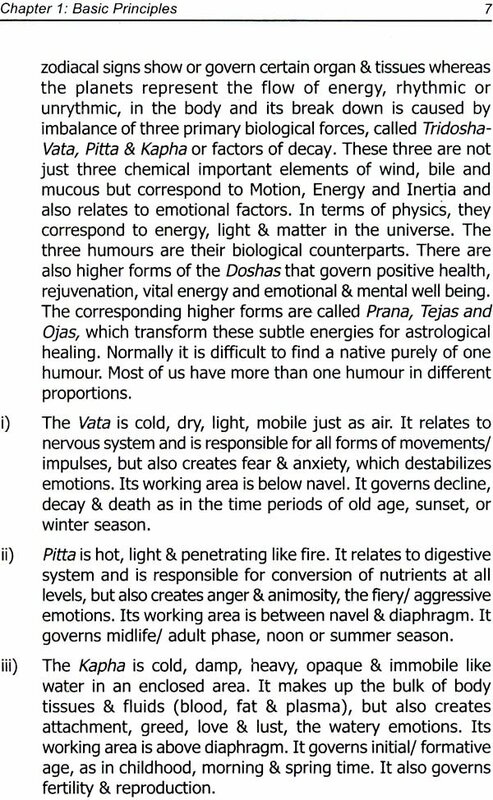 The diseases are generally indicated by the malefic indluences of lplanets which cause imbalance in the three Doshas or biological humors- Vata, Pitta & Kapha. Then there are some diseases which results from “Displacement”. This displacement or separation is caused by separatist planets- Sun, Saturn, Rahu and the 12th lord. Such diseases includes hernia, loss of pregnancy, slip disc, sterilization etc. 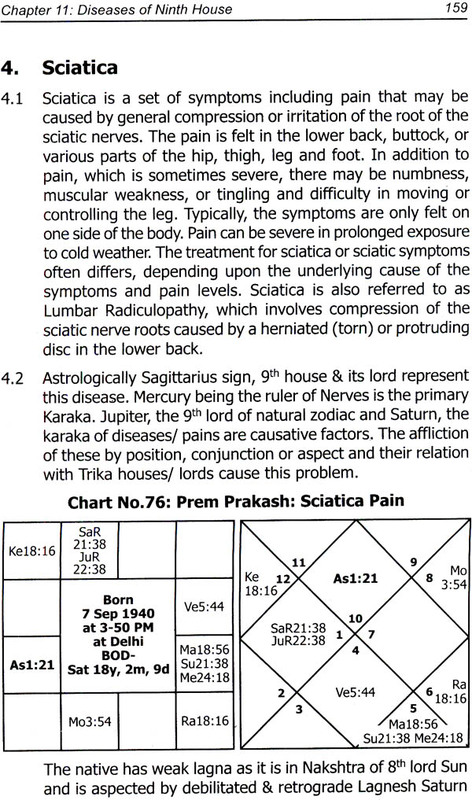 houses, signs and Nakshtras wherein the planets are placed indicate tendencies, susceptibility, resistance and potential of various ailments in the body. When these potential will manifest is dependent upon the time which can be ascertained by dasha periods and transit of planets. Normally chronic health problems are indicated by Ascendant, Sun, Moon, 6th& 8th hours and the signs, planets and Nakshtras associated with them. A strong and well placed Sun confers vitality, strong will, positive energy and body resistance against ailments; while Mars and Jupiter in similar situation bestows early & speedy recuperation and sound health. It is desirable that an intending practitioner of medical astrology should also have sufficient knowledge of disease or medical science or has help of a good medico; preferably he should be a medical man himself. For this reason, I am thankful for taking help of my son, Dr Sanjeev Singhal, who has an experience of over two decades of medicine/ surgery. I have also taken liberal help of internet/ Wikepedia to understand many aspects of disease from medical point of view. The numbers of diseases which a native may have to encounter are numbers of diseases which a native may have to encounter are numerous and it is almost impossible to bring them in the domain of any book. I have tried to cover a large number of prominent and life threatening diseases. These have generally been covered under various astrological houses representing them. There could be a difference of opinion about a disease falling in a particular house or the other. I feel, so long it has been covered, it should not matter. In addition I have considered some of the prominent ailments causing serious problems/ death to natives under a different chapter “Kings of Maladies”. 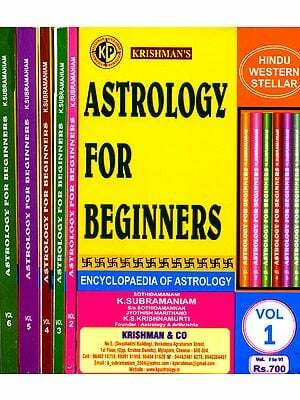 The first two chapters of the book contain basic/ fundamental principles‘/rules’ governing medical astrology and the last chapter is devoted to common astrological remedies with a new Karmic and practical point of view to propitiating evil planets causing ailments. The book has thus been covered under 16 chapters. The diseases have been explained with the help of 102 illustrative charts and nine tables. While discussing cassis of drowning and of fire, instead of charts of a native, I have purposely not discussed the aspect of longevity as it is a very vast subject and cannot be summarized in a chapter. The readers who are desirous to go through it, may refer my book “Longevity; A Vedic Approach”. In Indian context, most of the people do not want to relate their names with the diseases. Therefore in most of the cases of Indian natives, the names of the chart holders have been changed to keep their identity hidden. However the astrological data have been kept authentic. In preparation of the present work, the author does not claim originality. In fact I have borrowed the ideas, principles and explanations given in many classics and by some of the great astrologers, it is not possible to name all of them. However, I am indebted to the encouragement and blessings of Justice SN Kapoor, Shri AB Shukla and my teachers. It is also difficult to identify which ideas arose from whom, but the final form has an identity of its own. I have not the least intention to offend any astrologer or the native of the illustrated charts. However, inadvertently, if it has occurred, I offer my unconditional apology. I realize my personal limitations and alone am responsible for any shortcomings, which may come to light. I am thankful to Mr. Narendra Sagar for his suggestions and extra efforts to get it published on Priority. I am also thankful to my son Dr Sanjeev Singhal and friend Mr. Krishna Kumar for valuable suggestions/ assistance at various stage of the work. I can never forget the contribution and inspiration of my ever enthusiastic granddaughters- Monil & Ishita Singhal, who have encouraged and helped me in computer/ internet related works for my astrological pursuits. I do hope this effort would be of interest and use to all those who find the subject engrossing. I would fail in my duties, if I do not show my gratitude towards those who have appreciated my earlier works.